This game is a combination of T.V. show “Family Feud” and the board game “Compatibility”. The person running the game will approach a youth grouper before youth group, and ask them to answer some questions. For each question, “Jack” must provide 3-5 answers and rate them in order of importance. When the game is played in youth group, teams will be asked the same questions as “Jack” and they will have to try and give the same answers and in the same order of importance. Jack will reveal and explain his answers why he gave them in that order so that we all get to know him. After about 3 or so rounds, the team with the most points win. Give each person in the group a sheet of paper and tell them to write down (download) everything that they did, or that happened to them during the week (or holidays). Then get them to find another person or other people in the group who’s list has the most similar items to their own. Interview some of the groups or pairs then pray. This game is adapted from the Spicks and Specks game show where it is called “Substitute”. The aim is to teach the memory verse by singing it as many times and in as many ways as possible to help reinforce memorisation. Split into at least 4 teams. Give the memory verse for the term to each team or have it up on the projector or a whiteboard. Each team will also need to be given three tunes to well-known songs as well – you can use national anthems, pop songs, church songs etc. This game is played in 3 rounds. Before the start of each round, each team has a minute to practice among themselves singing the words of the memory verse to the tune of one of the well-known songs that they were given. Each team then takes turns in singing the memory verse to the tune of the well-known song while the other teams listen in and try to guess the tune of the song that is being sung. Teams only get one opportunity to make a guess and they “buzz in” when they think they know the tune. 1 point is awarded to the team that makes a correct guess, and 1 point given to the team that was singing the song that was correctly guessed. No points are awarded if no one guesses the tune of the song. This game courtesy of Mark Schroder, youth minister at Campbelltown Anglican. This game is based on the same game that has overtaken your news feed on Facebook! The idea: Try and guess the word that is being represented by 4 cryptic pictures. This activity is a great one for learning about Bible characters, Bible stories and each other. Round Three: Youth Group Character ie. leader or member. After a few minutes move on to next round. Finally, choose one of the categories and give a few details or extra facts about it. If its a youth group leader or member interview them and pray for them in your small groups/pairs. If the pictures are too cryptic, you can make a round easier by providing one or two bonus letters as clues. The object of this game is to help young people become familiar with stories from the gospels and as a secondary goal will help them mix with other young people at youth group. This game does NOT require players to have any prior knowledge of the Bible at all (though there is an advantage for people that do). You will need to download and print off one of the Story Card decks (download: Deck 1 here), 200gsm cardboard works well. Each deck contains 12 stories. Each story is split over 5 cards (Beginning, 1st Middle, 2nd Middle, 3rd Middle, and End). Only use enough cards to have complete stories, for example if you have 20 people playing use 20 cards that make up 4 complete stories. If you have an odd number of players, for example 22 people, see if you can make up the numbers with 3 leaders so you have 25 people playing the game and 5 complete stories. Split into groups of 5 people. 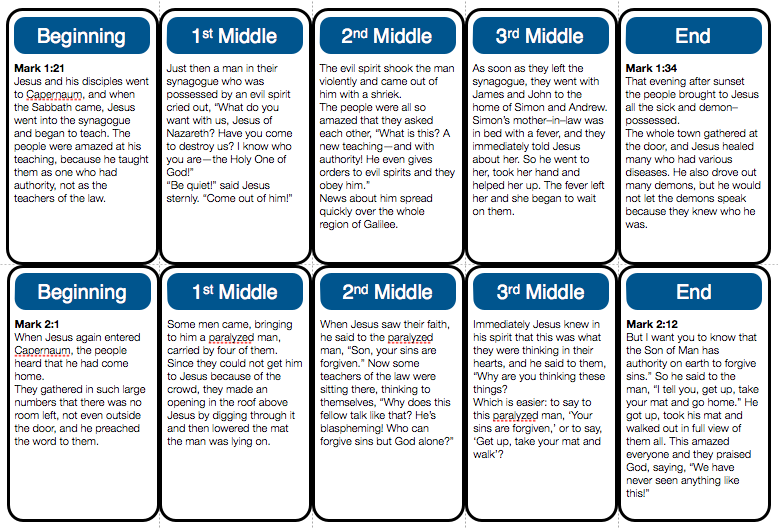 After you form everyone into teams of 5 you can work out how many bible stories you’ll use from the deck (eg. 10 teams = 10 stories. There’s 12 stories in a deck so remove the remaining 2 stories). Designate a captain from each team of 5 and deal out 1 card from each of the stories that you’re using (maybe just give them the “beginning” card from each story), that’ll leave a remaining 4 cards for each story in the deck. Shuffle the remaining deck of cards and distribute randomly. You should now have 10 teams where the captain has the beginning of a story but the rest of the cards in the team are mixed up and will all be from the different stories (though the law of averages will mean that there could be 1 or more other card/s in the team that matches the captains story card). The card that has been dealt to that person stays with them for the entire game. Give the groups a minute or so to work out if they have any cards that belong to the same story. After roughly a minute, sound a gong (or something) to indicate that the captains trading period has begun. Set a time limit for the trading period to encourage them to get on with it. The captains meet in the middle of the room (front or wherever the trading area is) and they start to work out a trade with other teams. Captains can only trade a maximum of two people (and their cards) each trading period. At first the captains will want to trade the maximum, so everyone will want to trade 2 players. As the game goes on and people are getting closer to piecing together their story, some will want to trade 1 and others 2, but no matter what happens a team MUST NOT exceed 5 players. It’ll be up to the captain to work out how to trade the players they want to swap (eg. If the captain wants to swap 2 players but everyone else only wants to swap 1, then the captain will need to swap their players to 2 different teams. No problem). The players remain in their teams with their cards during the trading period. Once the captains have struck a deal, then people move teams (taking their card with them). Once all the teams have traded, give them another minute or so to work out if they now have more cards that belong to the captain’s story. At the end of roughly a minute, start the next trading period and repeat the process until one group has one complete story. Check if the story is correct and then you may end the game there or continue until all groups have completed stories, though it is perhaps best to finish after 1 group has a complete story because of time. Have the winning group read out their complete story. Note: It’ll help to have another copy of the cards printed out complete on A4 pages so you can check if the completed stories are correct or give assistance for those who need it. Have a young person (or a few people) from youth group make a 30 second video (each) of their room, showing things that are on their desk, posters on their wall, the song playing on their iPod, their Bible open at the last passage they read, the clothes in their wardrobe, a musical instrument or any other quirky thing they might have (a pet snake for instance!). The whole idea is to give a snapshoot of their life and what they’re interested in. After watching the video at youth group, quiz the group on what they saw in the video (questions like: what poster was on the wall? What passage was their Bible open on? What was on their doona/quilt cover? etc). Reward those who make a correct answer (with chocolate or something). This game can be played in pairs or groups where you would have each pair/group make a list answering the questions about the video. Repeat the process if there’s more than one video. The aim of the activity is simply to better know someone at youth group. This game is designed to help young people to be discerning in regards to what they might hear in bible talks or what they overhear about the bible. It will encourage young people to really learn the Bible for themselves, as well as teaching them some stories from the bible. This game requires you to go through and change or add to a Bible story before hand. David was the youngest of twelve son’s and was by far the most popular. (False! 1 Samuel 16:10-11) He worked as a shepherd, and often had to kill Lions and Bears. He was also glowing with health and had a fine appearance. Because of his health and fine appearance he was appointed King. (False! 1 Samuel 16:7) Now, the Babylonians were invading Judah (False! 1 Samuel 17:1) They had a champion by the name of Goliath, who was about 9 ½ feet tall! He Defied the people of Israel, and challenged them to send him a person to fight. Lots of men volunteered, but David was chosen because of his practice fighting wild animals.(False! 1 Samuel 17:11) David was a little nervous, but took courage when the King lent him his personal set of armour. (False! 1 Samuel 17:38) He went down to the water and picked out five smooth stones, and with his sling in hand approached Goliath. Goliath taunted him, so david started shooting his stones at him, Goliath charged and with his last stone David knocked out Goliath. (False! 1 Samuel 17:49) David then chopped Goliath’s head off. When the enemy saw what had happened they dropped there weapons and bowed down in reverence and respect of the Lord, becoming Israelites. (False! 1 Samuel 17:51-53) From that point on, David became very popular and went to live with the King and his Son. Instructions: This game is played in teams and will require a sheet of paper and a pen for each team. Put the edited story on big screen (if you are able) and read the edited story out loud telling them to look out for ‘bible blunders’ which are places where the story has been changed or added to. Afterwards, give the teams 2 minutes or so to list all the mistakes by writing them on a sheet of paper. Once the time is completed, ask the teams to mark their list as you read out the list of the mistakes (honesty system!). A correct guess gets you one point, but an incorrect guess means you lose two points. After each mistake is announced, say how it really happened, so everyone knows how the story should actually go. At the end, ask people how many mistakes they got (Did they miss some? Did they think there was extra?) then tally up the scores. The team with the most points wins.